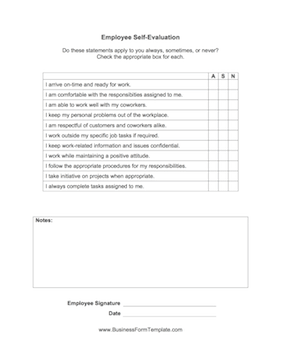 This Employee Self Evaluation Template has space for your employees to rate themselves on their work habits and behaviors. Do these statements apply to you always, sometimes, or never? Check the appropriate box for each. I arrive on-time and ready for work. I am comfortable with the responsibilities assigned to me. I am able to work well with my coworkers. I keep my personal problems out of the workplace. I am respectful of customers and coworkers alike. I work outside my specific job tasks if required. I keep work-related information and issues confidential. I work while maintaining a positive attitude. I follow the appropriate procedures for my responsibilities. I take initiative on projects when appropriate. I always complete tasks assigned to me.